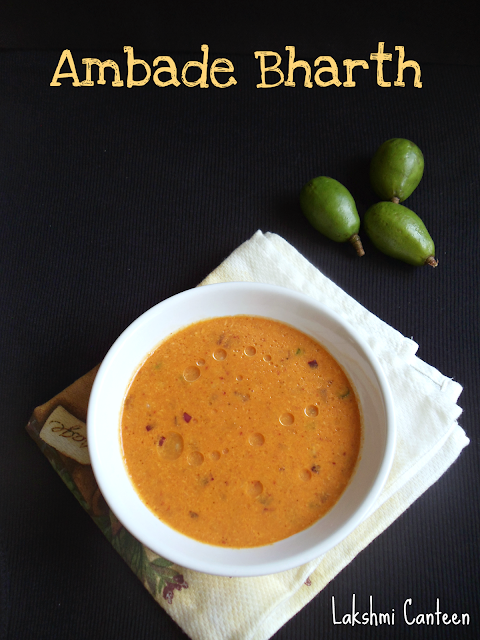 Ambade Bharth is a 'no- cook' coconut based dish. 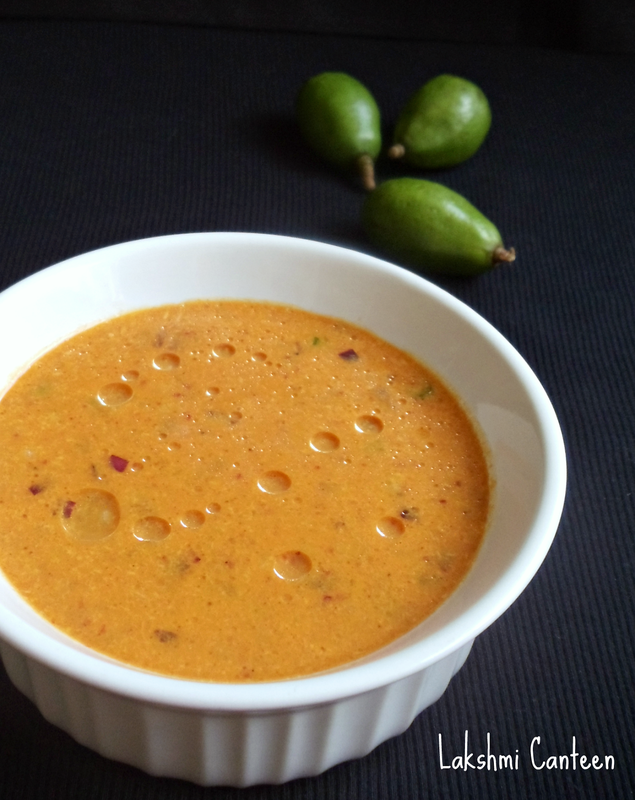 It is a traditional Konkani dish and unfortunately (I guess) this is in the list of forgotten recipes. In this dish the hog plums are used as a souring agent. The cooked hog plum pulp is mixed with spicy coconut paste, chopped onion, ginger and green chilli. It is then diluted with water to get desired consistency. Finally coconut oil is drizzled on top which gives a kick to the dish. It is generally served with white rice. I grew up eating this dish. My mother makes it whenever hog plums are in season. I used to help her in making it. It had been a long time since I had it. This is my first try in making it. While I was making, it brought back fond memories of cooking with my mother. It tasted exactly how my mother used to make. I am so glad to find the hog plums in my International stores. The dish is very simple yet tasty. Do try making it and I hope you will like it. Wash the hog plums and take them in a small saucepan along with 1/2 cup water and little salt. 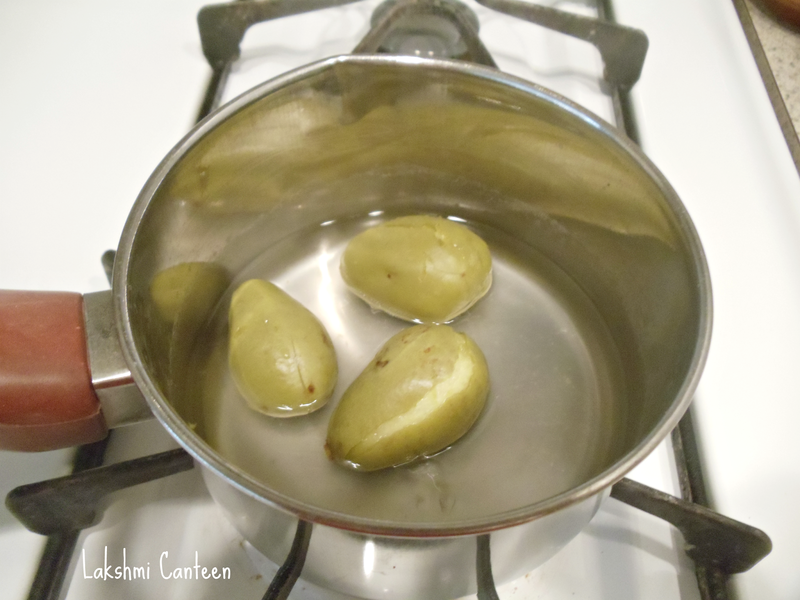 Cook them for 4-5 minutes or until it turns soft. Then turn off the heat and let it cool completely. 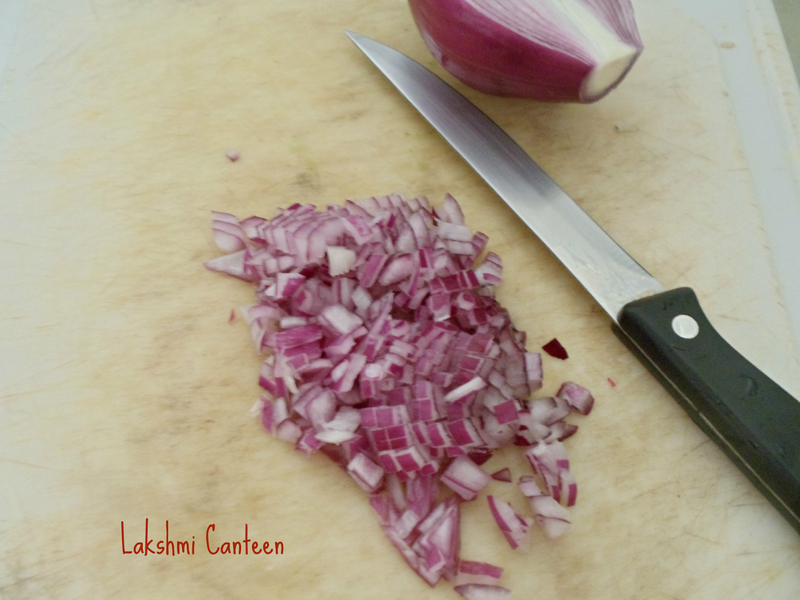 Meanwhile chop the onion, ginger and green chilli finely. Set it aside until required. 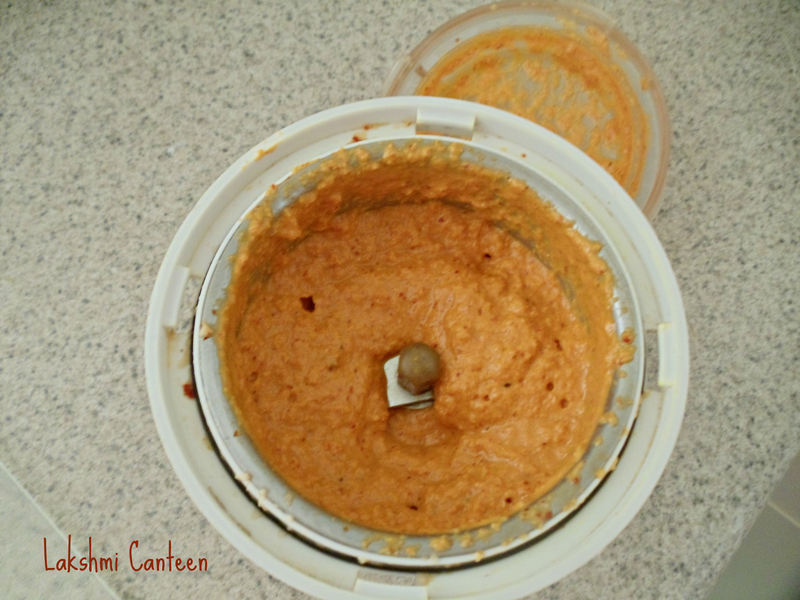 Now take grated coconut, roasted dry red chilli in a blender. Grind it along with little amount of water to get a paste (not very fine). Take a mixing bowl and mash the cooked hog plums. Remove the pulp as much as possible discarding the seed. (Usually hog plums has a seed in the middle. Mine was tender, hence it didn't have any). 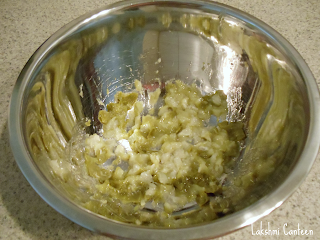 Then transfer the ground paste, chopped onion, ginger and green chilli into the bowl containing hog plum pulp. Add water to get the desired thickness (I kept it medium thick). Taste the mixture and add salt accordingly. Drizzle coconut oil at the end and give a good mix. 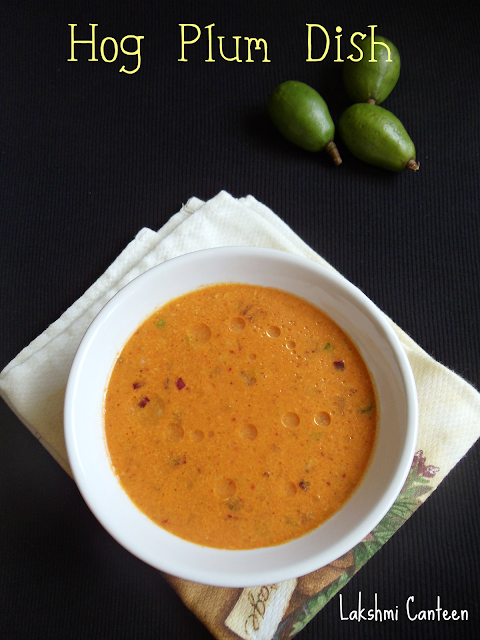 Serve it along with white rice and any side dish of your choice. Above measurement serves 2-3 people. 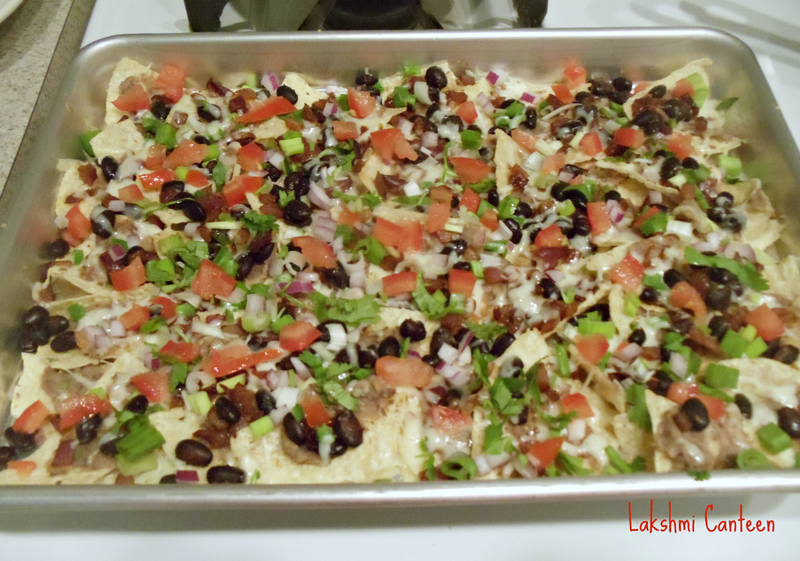 Nachos is one of my favorite appetizer. But we have stopped ordering whenever we go to a restaurant because they overload with cheese. So I started making it at home so that I can control the amount of cheese going into it. This way I enjoy it better and they are much healthier too. 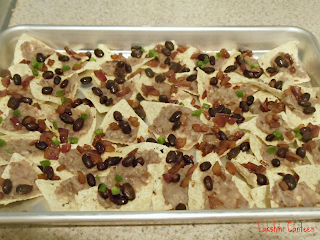 I used to make Nachos with refried beans and cheese. Then top it off with tomatoes and Onions. Recently I came across Hilah's recipe where she took time to slather each chip with the refried beans. I really liked the idea. 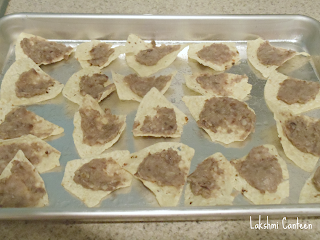 Its little time consuming but each chip will have refried beans. I omitted the meat from her recipe and made spicy black bean mixture. It turned out very good and we enjoyed it with Guacamole. 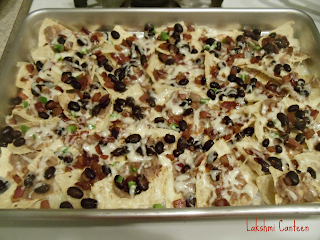 Do try making this version for a get together or just to treat yourself. I hope it turns out well for you! 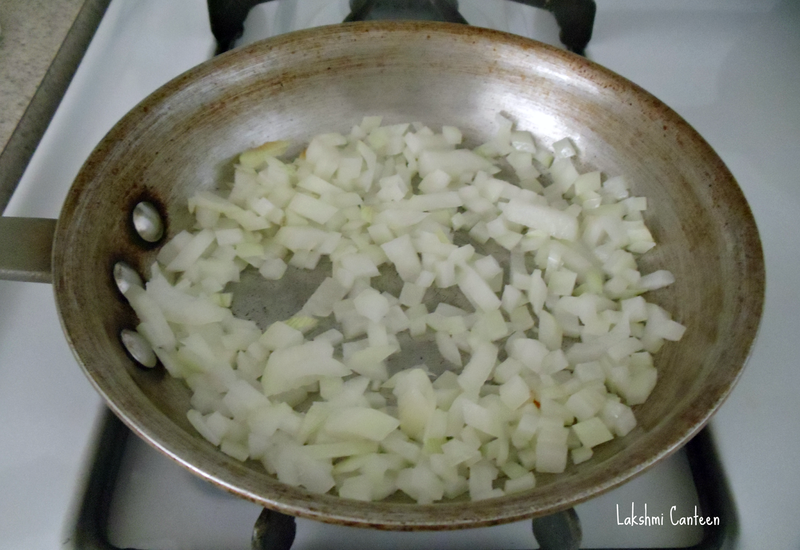 Chop the onions and set it aside. Then heat oil in a pan. 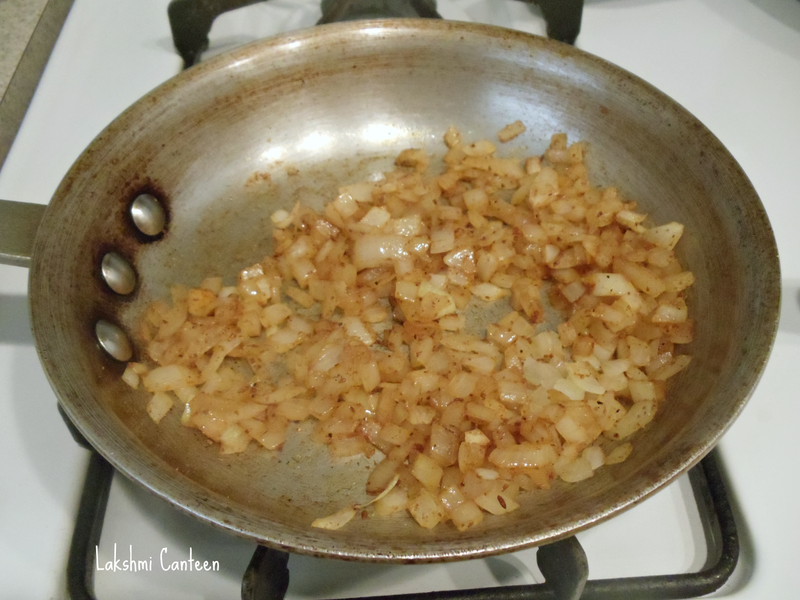 Once hot, add the chopped onion and fry it until it turns translucent. 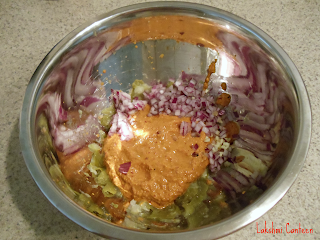 Then add cumin powder, red chilli powder and salt. Mix and continue frying the mixture for half a minute. Then add in the cooked black beans. Mix and let it fry for a minute and then turn off the heat. Set it aside until required. Now, preheat the oven to 350F (180C). 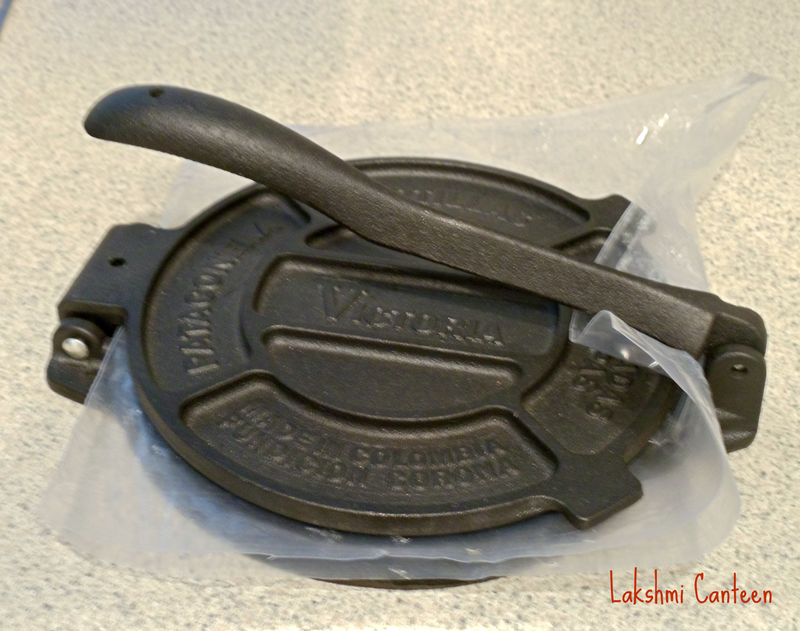 For assembling the corn chips you can use any oven safe dish like a pie dish, baking sheet, cast iron pan or a plate. I used a cookie sheet. 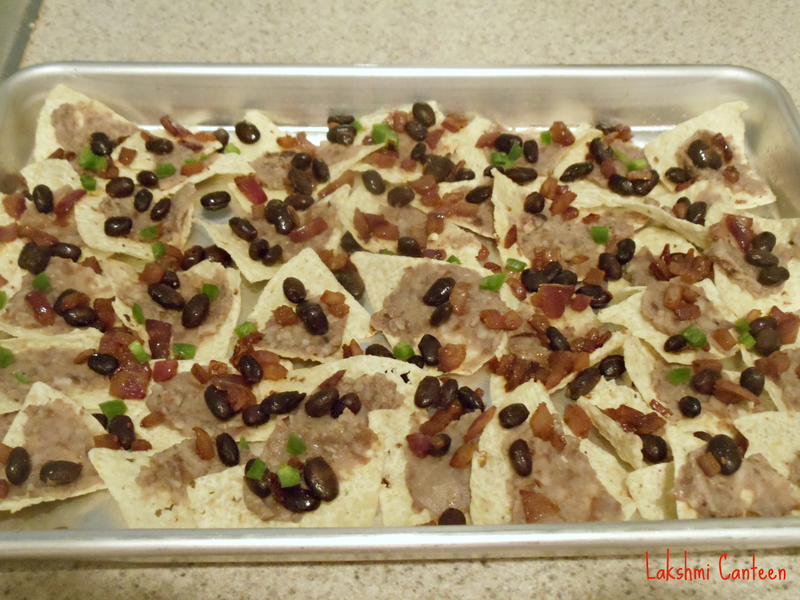 Slather each corn chip with desired amount of refried beans and start arranging them in the oven safe dish. Place them as close as possible. Then sprinkle the spicy black bean mixture followed by chopped jalapeño . 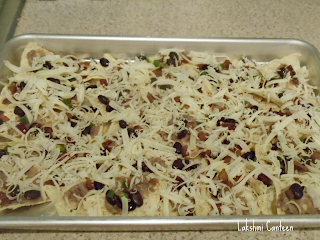 Then finally sprinkle grated cheese (At this point you can again repeat the layers if you want to serve a larger group. I just made for two of us). 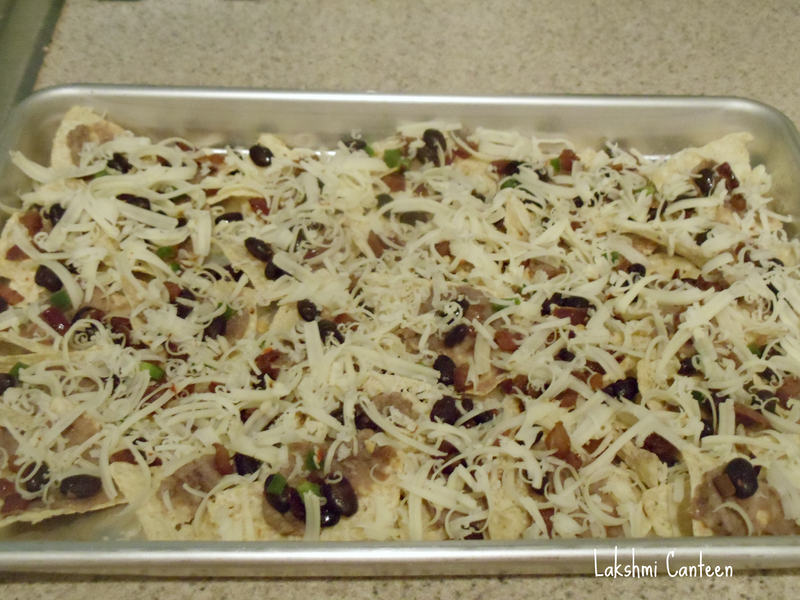 Pop it in the oven for 4-5 minutes or until the cheese is melted. 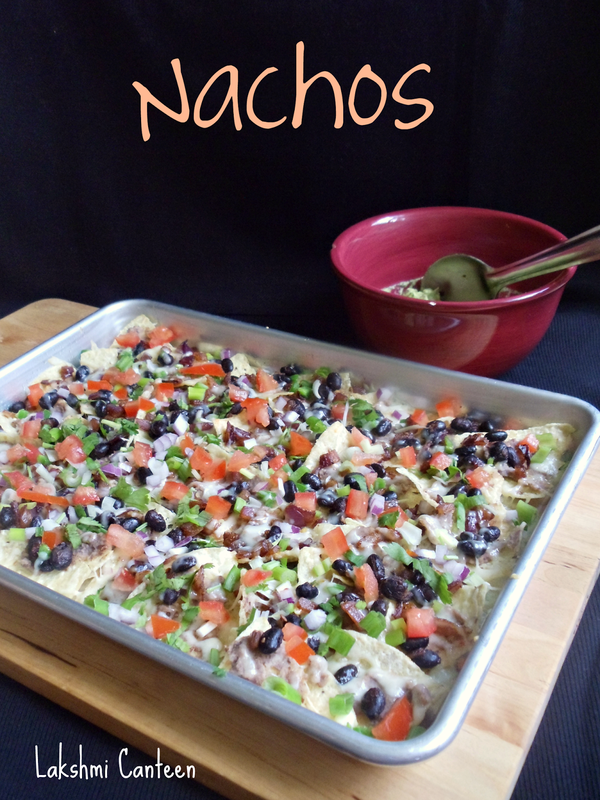 Once the cheese melts, garnish it with chopped cilantro, scallions, tomato and red onions. Serve it immediately along with Guacamole. Above measurement serves two. I am a great fan of few shows on Food Network. Recently when I was watching "Diners, Drive- In's and Dives", Pupusas were featured in one of the episodes. I was amazed at how he made them. Till then I had never heard of it. So I decided to make Vegetarian version. It did turn out quite amazing and we both loved it a lot. Hence I thought of sharing the recipe. Pupusas are made by stuffing the masa. They are either stuffed with cheese, meat, refried beans. 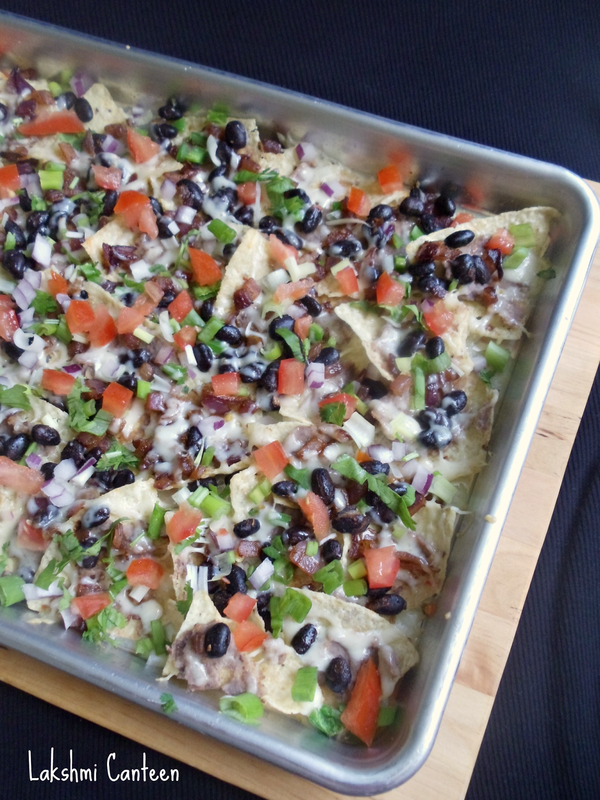 I decided to stuff my most favorite beans - black beans. They turned out very tasty. Do try making them. The process looks little involved but trust me its worth every minute of your effort. Please let me know if you give this a try. 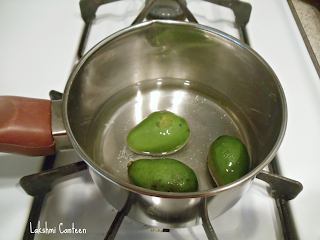 I prepared the guacamole and Pica de gallo beforehand and sticked them in the refrigerator until required. 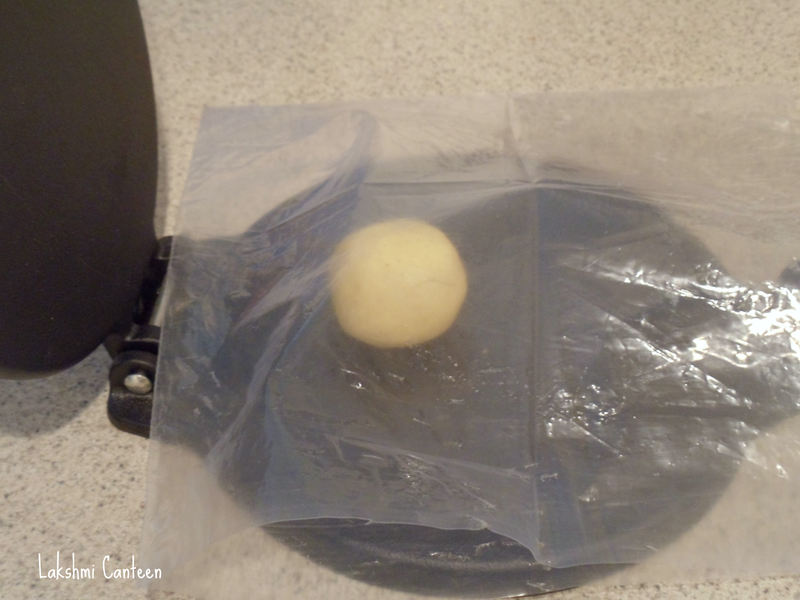 Shred the cheese and set it aside. 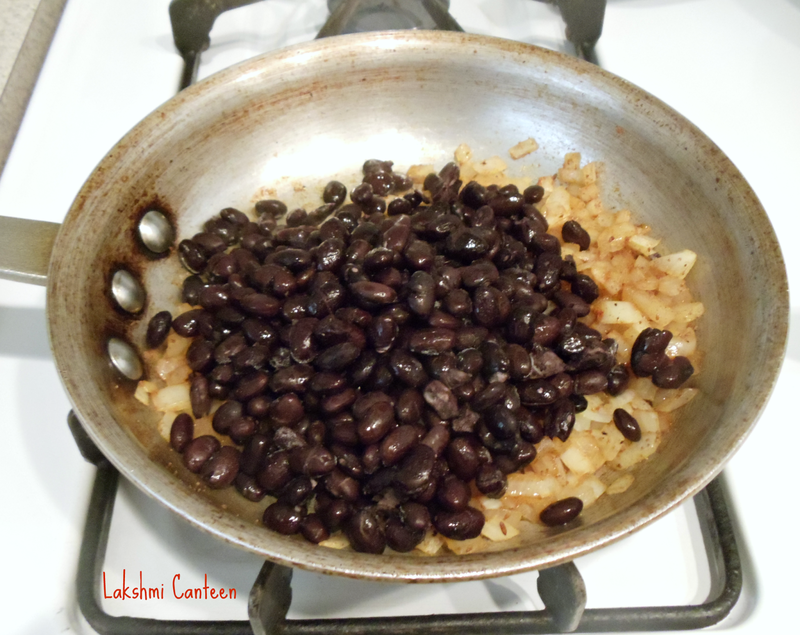 Then add in the cooked black beans along with water. 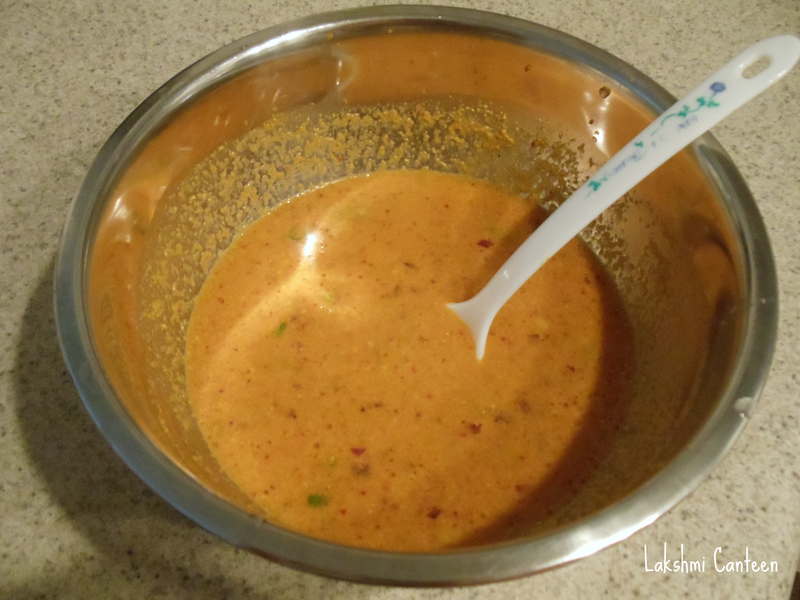 Let this mixture cook until most of the moisture evaporates. Then turn off the heat. Squeeze in lime juice and cover this mixture and set it aside until required. 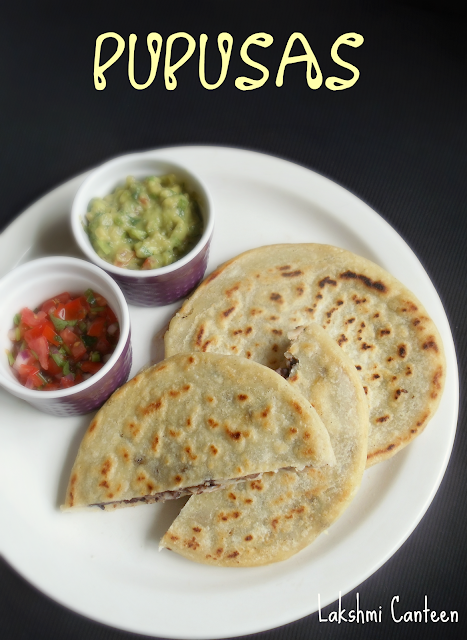 Before writing down the procedure, let me write few things required to make tortillas. 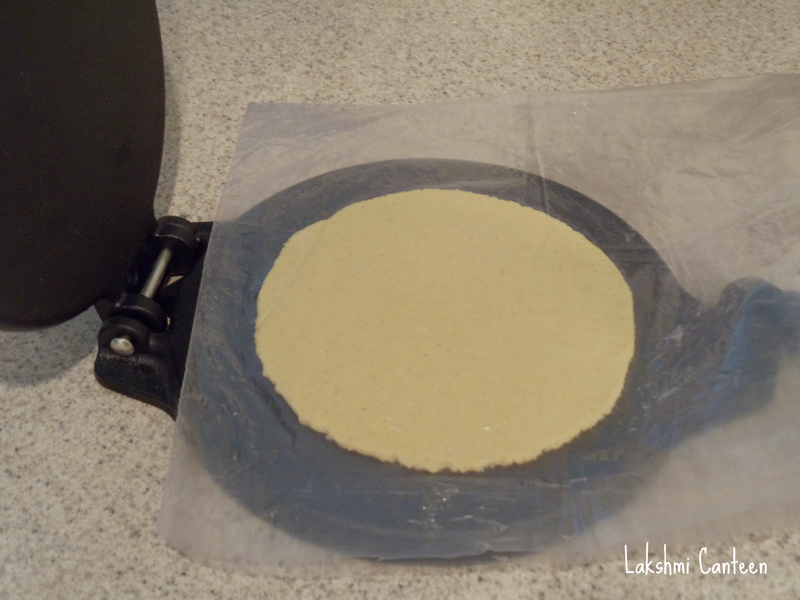 Tortilla Press - I recommend buying a tortilla press if you plan making corn tortillas on regular basis. If you don't want to invest on it then you can always use a large plate or pie dish to press out the dough. 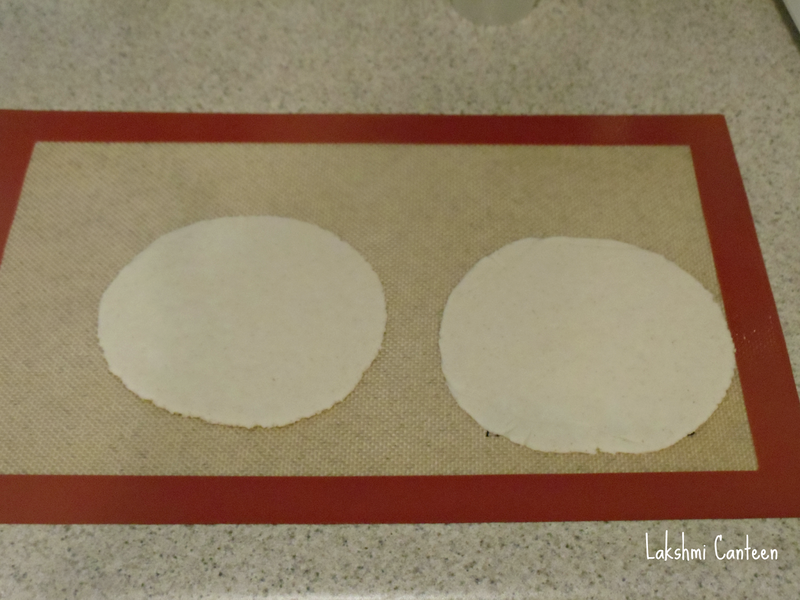 Zip loc/Parchment paper - Always line your tortilla press with zip loc (cut open one or two side of it) or parchment paper (2 square pieces of it). 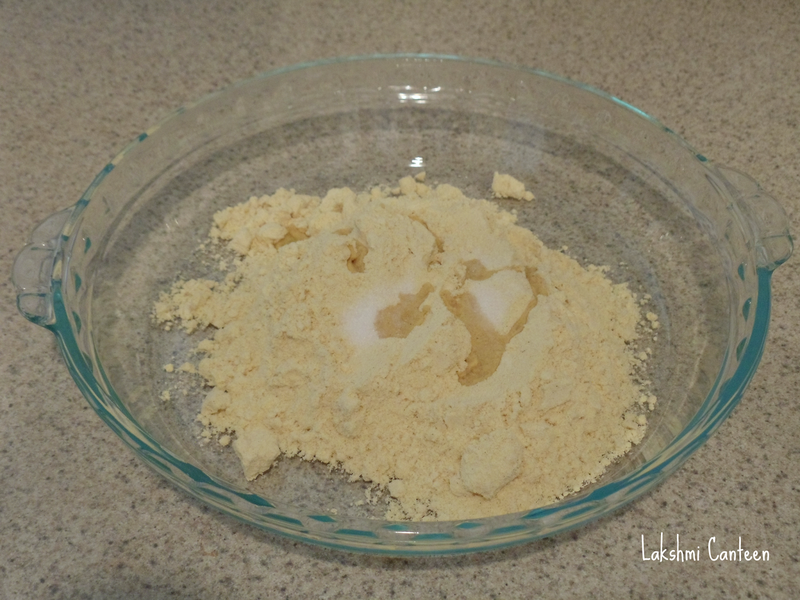 Take masa, salt and oil in a bowl. Mix well and then hot water little at a time. Mix with a spoon . 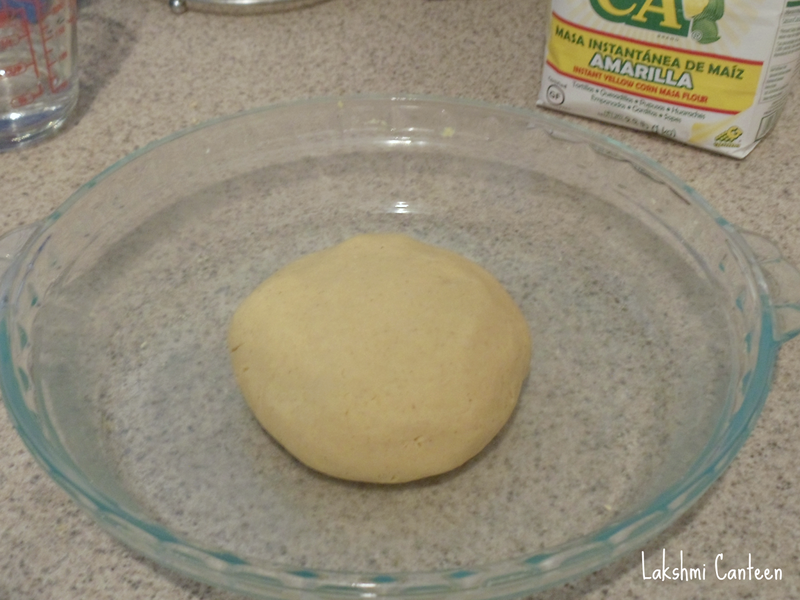 Once it comes together mix with your hands until you get a non sticky, smooth dough. Keep it covered and let it sit for five minutes. Then divide the dough into six equal portions and smoothen them between your palms. 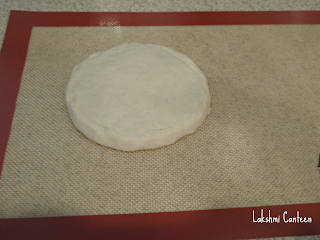 Now line the tortilla press with a zip loc (or parchment paper) and place one of the dough ball in the zip loc. 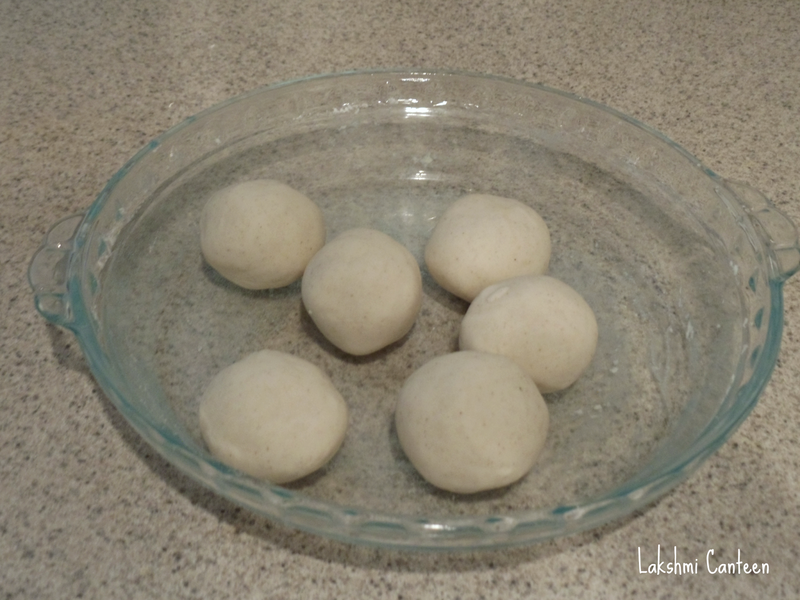 The dough ball takes a beautiful round shape. 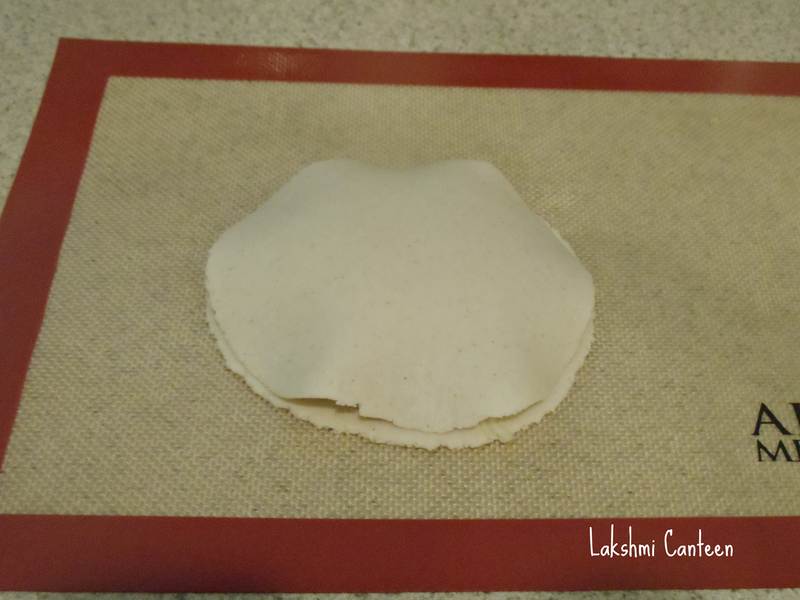 Transfer the tortilla on a parchment paper or silicone mat. 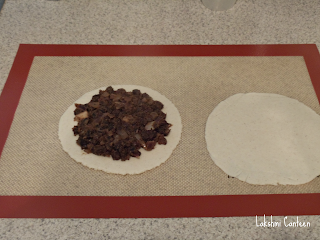 Then repeat with another dough ball and place them side by side (Each pupusas requires two rolled corn tortilla. 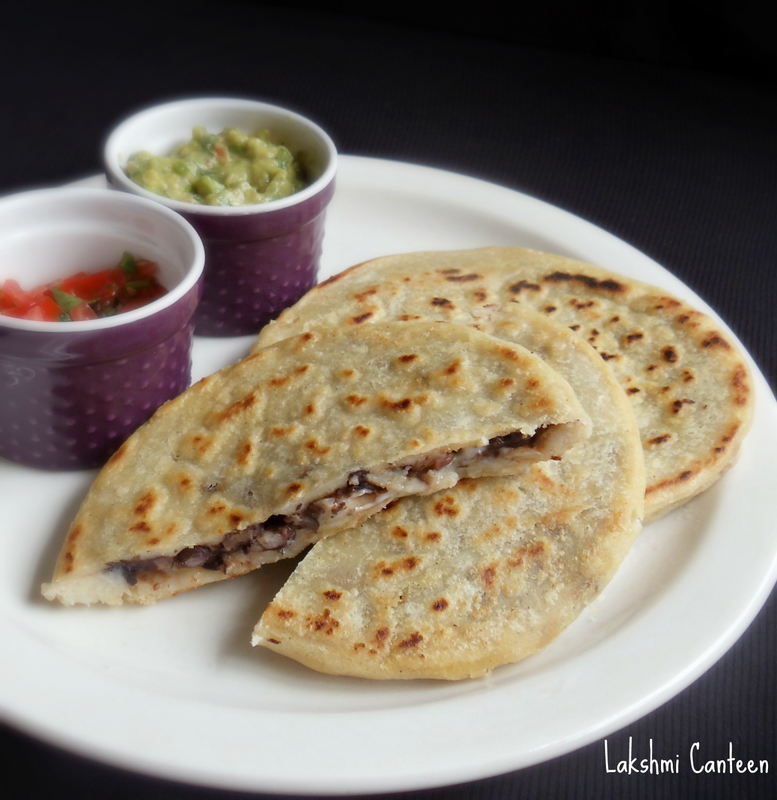 This is one way of making pupusas). 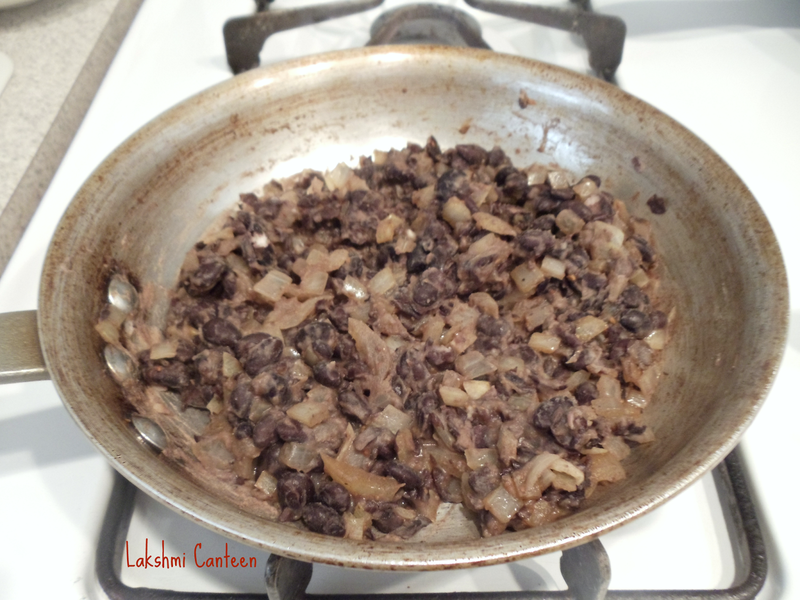 Divide the black bean mixture into three equal portions. 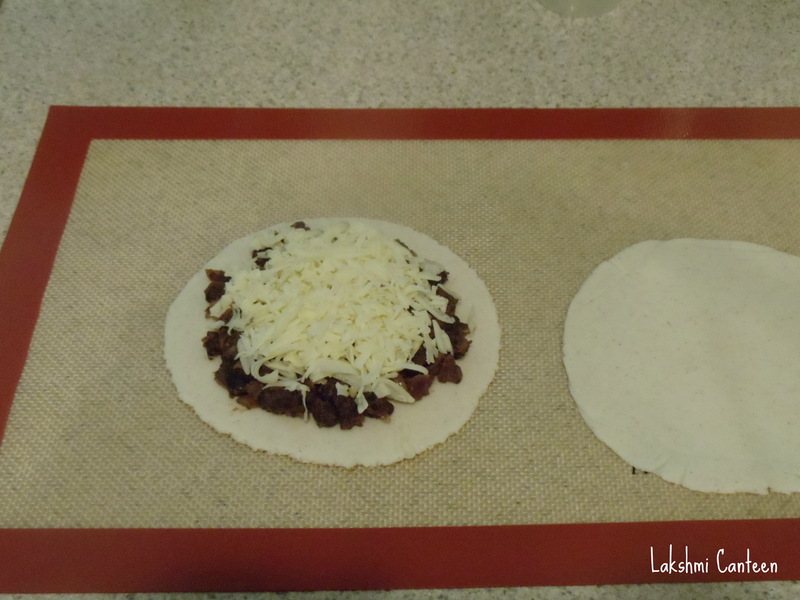 Then spread one portion on one of the rolled corn tortilla, as shown below. 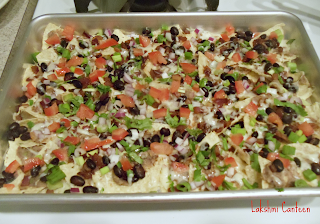 Then sprinkle shredded cheese on the black bean mixture as shown below. Now gently place the plain corn tortilla which was besides it. 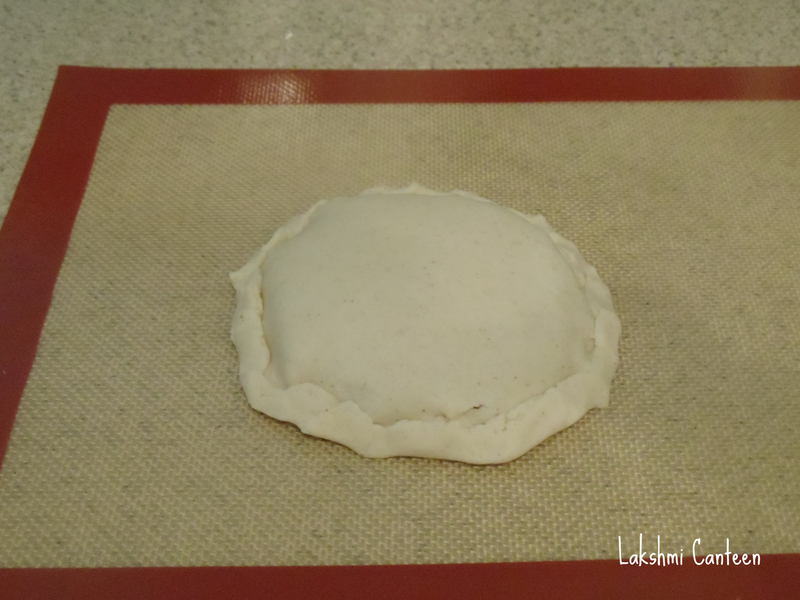 Then slowly start pinching the dough along the circumference so as to form a pocket. Once done, smoothen it carefully so that the stuffed mixture doesn't get a chance to come out while pan frying. 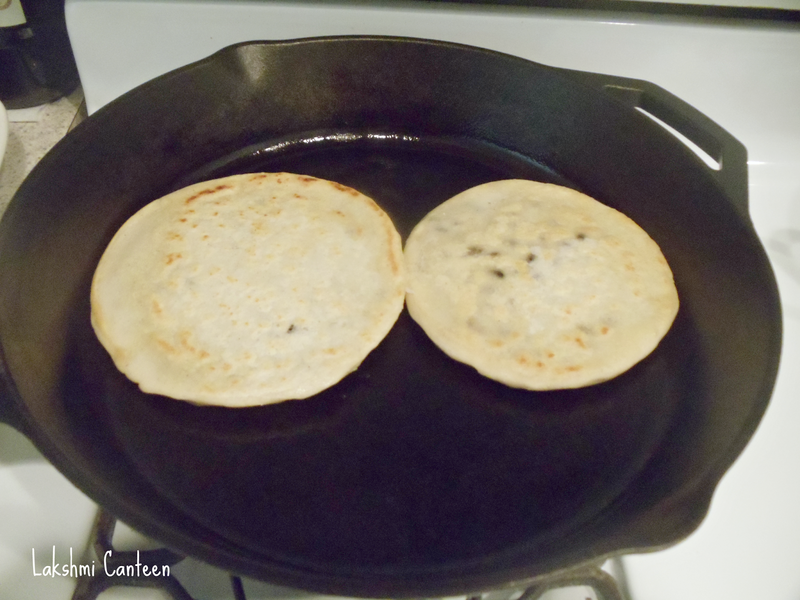 Repeat the process to make two more pupusas. Once done, spread some oil on a pre heated skillet and place the prepared pupusas. Spread some oil on the surface too. 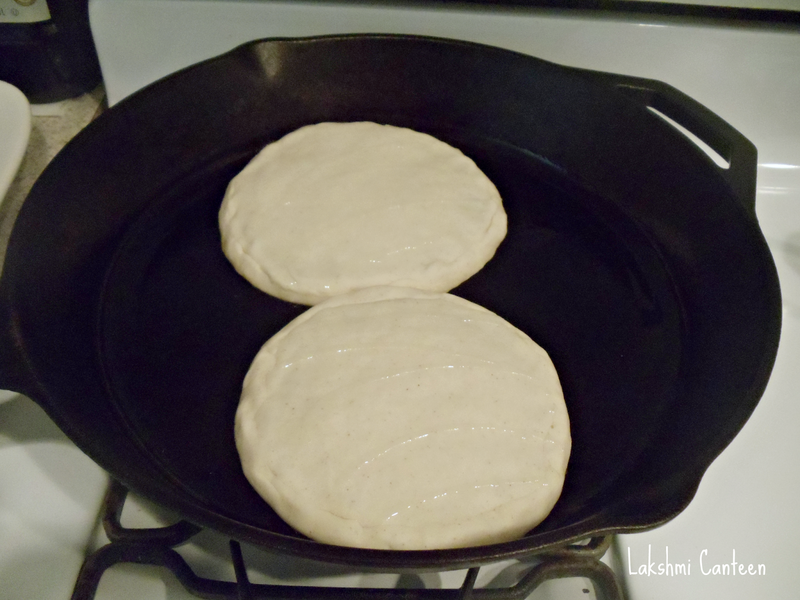 Once it turns golden brown, flip it gently to fry the other side. Once both the sides turn golden brown, transfer it to a plate. 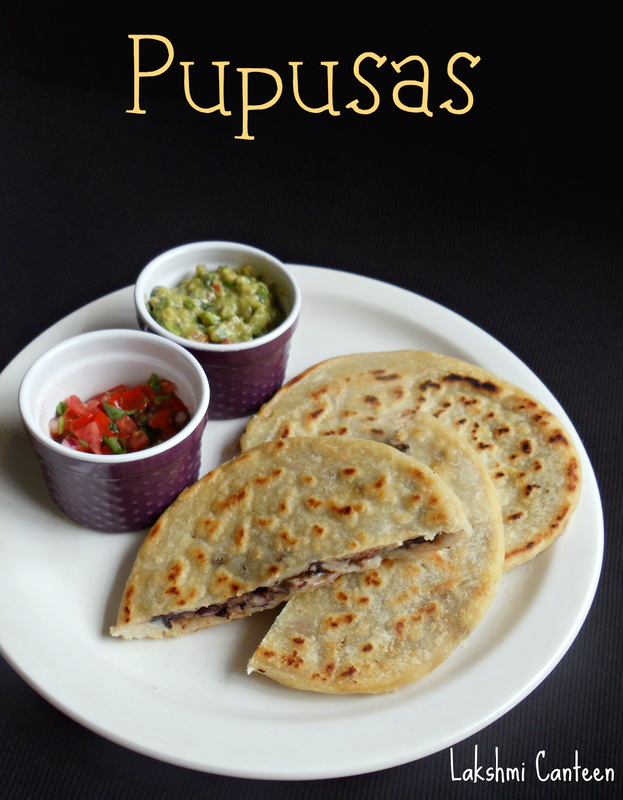 Fry the remaining pupusa. 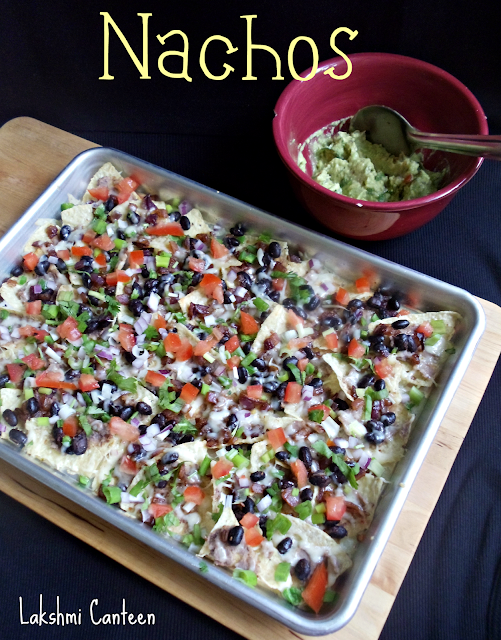 Serve it hot with Guacamole and Pica de gallo or any toppings of your choice. Above measurement makes three good sized pupusas.